This post is about hacking the spark.components.Window component in the Flex 4 SDK. 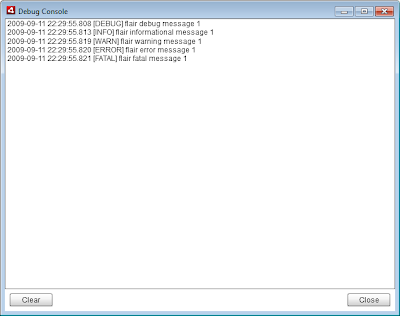 I wanted to create a simple debug console for an AIR application at work. 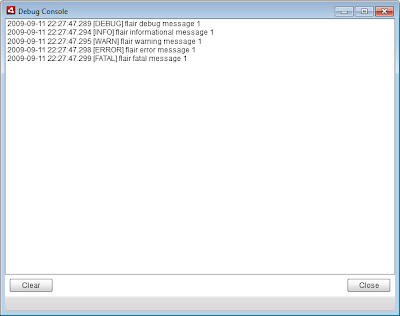 Nothing fancy, just a standalone window with a non-editable text area for displaying log messages. This debug console should be accessible through a tray/dock menu and via a global keyboard shortcut. this.removeChild(statusBar as DisplayObject) throws an Error: removeChild() is not available in this class. Instead, use removeElement() or modify the skin, if you have one. As you may see, there's a lot of bogus going on because of different types; removeChild() works on DisplayObject classes, removeElement() works on IVisualElement classes, statusBar.parent returns a DisplayObjectContainer which doesn't have removeElement(), etc. This doesn't exactly go hand in hand with my intentions of using the window as a debug console, where you'd open the console and check something, close it, wait for something to happen, then reopen the console and check for any messages. Of course, I do understand why the window is destroyed per default. It saves memory, and one might argue that in most cases you'd actually want it to be destroyed. In my case, though, this is not desirable, so let's hack it. There's a two-step solution to making the Window behave as desired. Add an event handler for the closing event, in which you prevent default action and instead hide the window. Override the open() method and add some more logic to it. * Adds message to console. 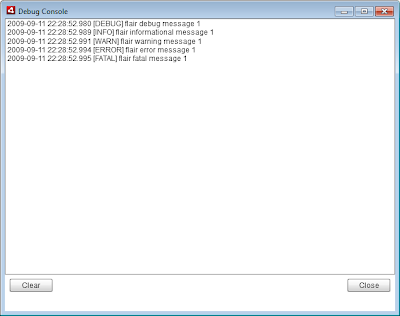 * @param  message  Message to add to console. * Hack to prevent window destruction. I've been a bit annoyed lately by having to recompile/reinstall the kernel module for my Creative X-Fi soundcard every time Ubuntu updates the kernel. Thinking it should be possible to automate this process, I recalled seeing something about compiling and installing modules (nvidia and vbox) every time a kernel is booted for the first time. Surely enough, there's DKMS! DKMS stands for Dynamic Kernel Module Support, and will basically compile and install kernel modules automatically every time the kernel is updated, keeping things consistent and easy to use for the end user. Following is how to set it up for the X-Fi driver. Download the source from Creative's support site. At the time of this writing, I get a file called XFiDrv_Linux_Public_US_1.00.tar.gz. If you get a different file, make a note of the version, which will be used in the next step. As root, extract the contents of the archive to /usr/src/ctxfi-1.00. DKMS is a bit peculiar about location/structure, so help yourself out and go by the flow, which is to use /usr/src/<module>-<version> as the main directory for the module's source code. To clarify; /usr/src/ctxfi-1.00 should contain a bunch of source files and a Makefile. Okay, that should be it. The next time you boot a new kernel, you shouldn't have to manually compile/install the X-Fi driver. Due to an uncertain future for my own server, I am migrating my blog to blogger.com/blogspot.com. Once I'm able to extract posts from the old blog, I'll hack them into this blog. I chose blogger/blogspot over wordpress.com, because Wordpress wants money to use a custom domain. A twenty-something software engineer, originally from the arctic town of Harstad in Northern Norway.